Find the range your student's box number falls in, and use that address format. Notice the street number. Do not use 414 N. Meridian St. (the university address) for student mail. Incorrectly addressed mail, as well as mail without box numbers, is delayed. 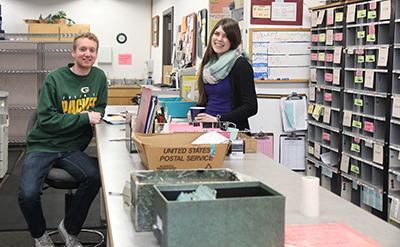 University Mail Services receives mail through USPS, UPS, Federal Express and other carriers. We provide service at North Street Annex for outgoing mail/packages. We sell a variety of envelopes and stamps. Stamps are available in books, sheets, or one at a time. Packages and items of mail that are too large to fit into a student's PO box are stored at University Mail Services and the student is emailed that they have a package. Photo ID is required for package pick-up. University Mail Services acts as the agent. These items require photo ID and a signature from the student for pick-up. Student will receive an email about the item of mail. Outgoing U.S. Mail and UPS packages must be sent from University Mail Services located in North Street Annex. University-related campus mail from university offices, professors or students is delivered throughout the day. No postage is required for this mail.